a torture but a joy for the pupil; instill a thirst for finer music in him, a thirst which will last for a lifetime. 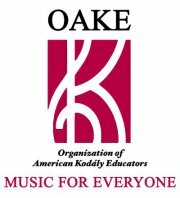 Maryland United Specialists in Kodály (MUSIK) is the Maryland chapter of the Organization of American Kodály Educators (OAKE). During the course of each school year, we hold FREE professional development workshops, classes, and social events that are open to everyone interested in excellence in music education. EVERYONE IS WELCOME! No prior training or experience in the Kodály method is necessary. MUSIK will be using this website to talk about teaching techniques, songs, resources, teaching aids, and upcoming events in Maryland. On this site, you can find up-to-date information about upcoming MUSIK workshops, OAKE conferences, Kodály training/certification, job openings, and resources. Enjoy and please feel free to contact us at MUSIKchapter@gmail.com if you have any questions or comments.